Much of the anticipated future growth in the United States will take place in suburbia. The critical challenge is how to accommodate this growth in a sustainable and resilient manner. 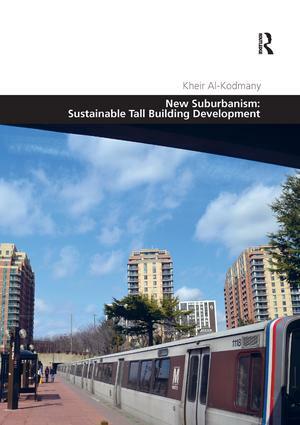 This book explores the role of suburban tall as a viable, sustainable alternative to continued suburban sprawl. It identifies 10 spatial patterns in which tall buildings have been integrated into the American suburbs. The study concludes that the Tall Building and Transit-Oriented-Development (TB-TOD) model is the most appropriate to promote sustainable suburbanism. The findings are based on analyzing over 300 projects in 24 suburban communities within three major metropolitan areas including: Washington, DC, Miami, Florida, and Chicago, Illinois. The book furnishes planning strategies that address the social, economic, and environmental aspects of sustainable tall building development. It also discusses sustainable architectural design and site planning strategies and provides case studies of sustainable tall buildings that were successfully integrated into suburban settings. Kheir Al-Kodmany is a Professor of Sustainable Urban Design in the Department of Urban Planning and Policy at the University of Illinois at Chicago (UIC). His recent book entitled Eco-Towers: Sustainable Cities in the Sky (2015) is an encyclopedia on green design and tall buildings. His earlier book, co-authored with Professor Mir Ali, is entitled The Future of the City: Tall Buildings and Urban Design (2012). Professor Al-Kodmany has published nearly 100 articles on planning and architectural design; some appeared in top peer-reviewed journals. Before joining the UIC faculty, Professor Al-Kodmany worked on tall building projects as an architectural designer for the Chicago firm Skidmore, Owings & Merrill and he continues consulting on architecture and planning projects. He won several international architectural and urban design competitions. He also worked as a consultant to the Jordanian Government on integrating high-rise development in the Amman Master Plan. He received his early training in architecture from his late father Professor Abdul Muhsen Al-Kodmany, a Le Corbusier trainee. Professor Al-Kodmany helped the Saudi Government in facilitating the performance of safe Hajj by applying visualization and crowd management techniques to reconfigure and expand the existing infrastructure to accommodate about three million pilgrims who travel to Mecca for the event annually. He helped the City of Chicago in crowd management, emergency evacuation and planning for the 'Taste of Chicago' event. He also served as the Co-Director of the Urban Data Visualization Laboratory at UIC where he developed 3D modeling, virtual reality, GIS, and web-based mapping survey tools and software for effective participatory planning and design.